With summertime right around the corner, I am trying to watch what I eat so I can look good for bikini season. Finding the right foods to add in your diet, as well as eliminating some, can help trim that waist in no time! I am a firm believer of avoiding foods with sugars and incorporating healthy fats, such as coconut oil, into my diet. I have always loved having muffins for breakfast as my source of carbohydrates, pairing them with eggs or a protein shake. The only problem with muffins that I have ever had is the high fat content that is usually filled from butter or vegetable oil. To solve this problem, I started using coconut oil in any of my muffin recipes as a substitute. Coconut oil contains medium chain triglycerides, which are utilized as energy when consumed, so this may even give you an added energy boost when starting your morning! Combine bananas, coconut oil, egg, almond milk, and vanilla in a medium bowl. Mix well and set aside. 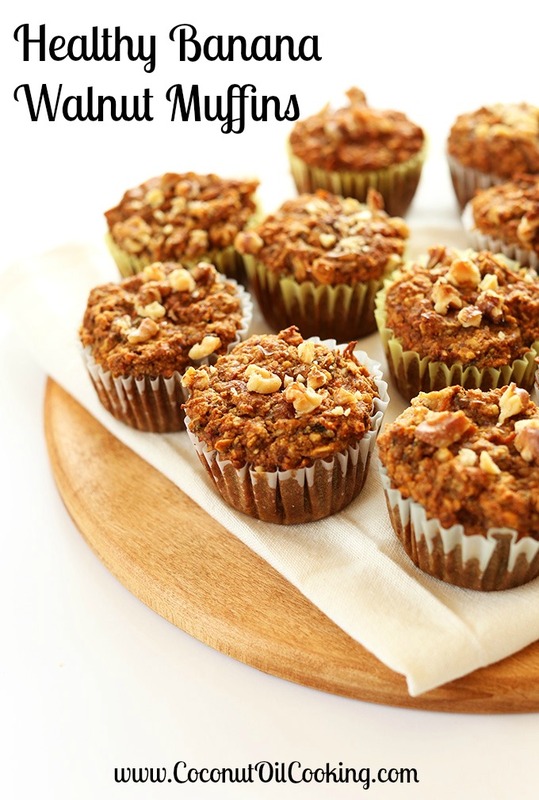 Place whole wheat flour into a medium bowl and add oats, Stevia, baking powder, cinnamon, salt, and walnuts. Whisk all ingredients together. Next, stir the flour mixture in with the banana mixture until all ingredients are fully combined. Line a muffin pan with baking cups and spray cups with Kelapo coconut oil cooking spray. Add muffin batter into cups, approximately to the top. Place in oven and baking for 20-25 minutes. Test muffins with a toothpick in the center to be sure they are finished, add additional time if needed. Top with additional chopped walnuts if desired. Enjoy! 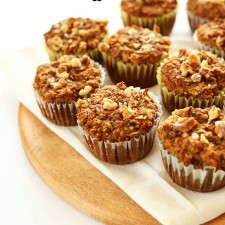 These muffins are great to store in the fridge and heat up each morning right before I leave for work – yum! For more healthy muffin recipes, try our Lemon Blueberry Muffins, Apple, Coconut, and Walnut Protein Muffins, or Healthy Sweet Potato Muffins. What are some of your favorite foods to make for bikini season?